New research suggests that this coin marks an eclipse of Jupiter by the moon. a star like object hovering above the palm of his right hand. 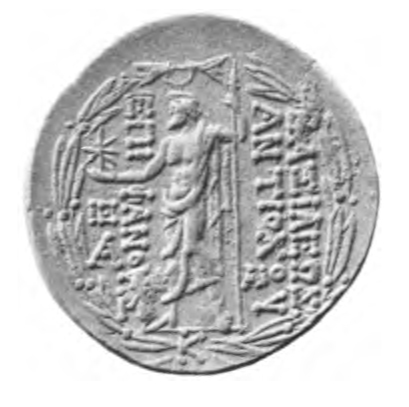 Antiochos VIII was ruler of the Seleucid Empire, a kingdom created by one of Alexander the Great’s officers, after the great conqueror died in 323 BC. By the time of Antiochos this realm was composed of a rump of territory centred on the city of Antioch, in south-eastern Turkey. The empire had been in decline for some time, with the Parthians gaining territory in the east, the Romans in the west and the Hasmoneans, a dynasty of Jewish kings, coming to power in the south. Perhaps fearing for his own life Antiochos VIII had her put to death in 121 BC, making him sole ruler of what was left of the Seleucid kingdom. Weir is a Classics professor with an interest in astronomy and ancient coins. He was curious why Antiochos VIII would mint a piece of currency with such an unusual drawing – could there have been something going on in the night sky? That wasn’t all that was going on in the night sky. “I noticed that there were other favourable occultations happening at the same time. There was another occultation of Jupiter within the year and just a week after the first one there was an occultation of Venus which is also a very good omen,” he said. Weir pointed out that astrologers were powerful figures in the ancient world and the discipline they practiced was influential. “These people were everywhere and we know they were influential in influencing emperors in Rome for instance,” he said. Unfortunately for Antiochos VIII his rule would be anything but great. In the years that followed his empire would endure conflict, with one of his brothers, Antiochos IX, disputing his right to the throne. Eventually the two had to agree to divide what was left of the Seleucid kingdom. The heavens, it seemed, had turned against the king. "After Antiochus VIII defeated usurper Alexander II Zabinas in 123 BC his mother tried to poison him with wine, but the suspicious king forced her to drink the cup herself, and so she died. (The story may have been inspired by the fact that Grypus was interested in toxicology; some poems about poisonous herbs believed to have been written by him are quoted by the famous physician Galen.)" Thx for sharing Brian. I'm not certain if the story is true (it could be apocryphal) but it certainly fits with what we know of these individuals. I have the same coin and i think it is made of brass .